Custom-fit windshield sunshade to keep things cool! 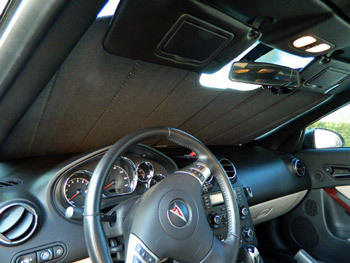 Keep your cool and your interior looking hot with Covercraft’s ultraviolet heat shield. It greatly reduces interior temperature while protecting your interior from the sun’s damaging rays that come through the front windshield. The outward-facing surface is high-quality silver reflective fabric; the inside is soft pellon felt. Both fabrics are laminated to a foam board which acts as an insulator to reduce heat build-up. Especially in places like down here in South Florida where the sun can be pretty brutal year around, keeping the temperature inside your car from going through the roof is much appreciated. Protection. All day in the hot sun takes a toll on the condition of your car whether you like it or not. Radiation that enters through your car’s windshield quickly turns the inside of your car into an inferno while the interior surfaces bake. This eventually causes deterioration of leather, vinyl, rubber, fabric and fibers. Lovely, like-new vinyl, rubber and leather surfaces dry, harden, and crack just as skin does when spending too much time in the sun unprotected. Carpet and fabric surfaces will dull and fade—and you can’t bring them back to life. 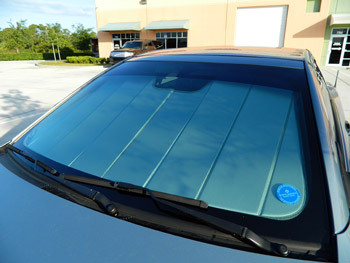 The UVS100 ultraviolet heat shield helps reduce heat build-up and completely blocks out the sun. The custom fit (over 400 styles) means a perfect fit—no fumbling and fighting to keep it in place. Simply unfold the heat shield, position it across the inside of your windshield, and lower your visors to hold it in place. It fits snuggly and stays put while the car stays significantly cooler. 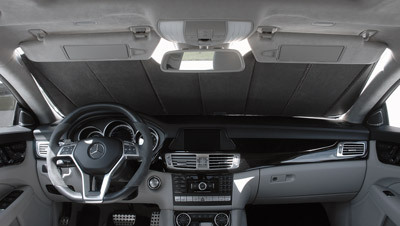 Interior surfaces remain cool and protected. When it’s time to set out again, remove your heat shield, fold it up accordion-style. I’d advise adding the optional storage bag to your order to keep your heat shield in new condition. In your trunk or back seat it stays neatly protected. If you live in an area that you don’t need it year around, it will be safely waiting for you come next summer. Normal fitment: Some applications fit perfectly snug at all four corners. Normal fitment: Some applications require extra room (top and sides). Please note: Fitment may vary from vehicle to vehicle due to windshield and dashboard design and in vehicle safety systems. If you have a particular question about your application, please give us a call at 1-800-869-3011. Express shipping and International shipping are not available on this item. Got one for my truck and my wife's truck. Mine even fits with my radar detector mounted under my rear view mirror. Excellent quality and fit well. The CoverCraft heat shields fit perfectly. Construction is excellent! ProsPerfect fit. Adequately held in place by sun visors. Construction quality ensures durability and longevity. Great product, exact fit, and fast shipping. I have had many heat shields over the years, I find these the best We have ever had. At first when I read about them on the internet, I thought they was a bit pricey, but after using them, I defiantly would purchase them again for another car. ProsThe best you can get. they really help keep your car cool better than any cheep ones by a long shot. Consa bit bulky, a little harder to maneuver than the flimsy ones, but well worth the very small inconvenience.